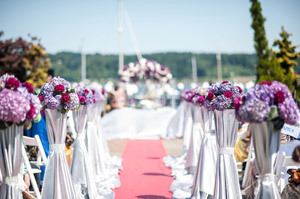 Thank you for considering Kitsap County's premier waterfront venue, Kitsap Conference Center at Bremerton Harborside, for your very special day. 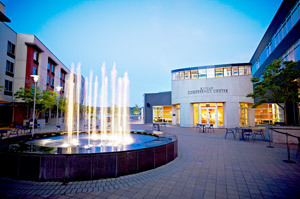 Steps from the Bremerton-Seattle ferry landing and centrally located in Kitsap County, we are easily accessible to all guests. If you need overnight accommodations, the 105-room Hampton Inn is conveniently located across the plaza and the 130-room Fairfield Inn & Suites is located on nearby 4th Street. With both outdoor and indoor ceremony locations to choose from, you can select the space that best fits your personality and style. 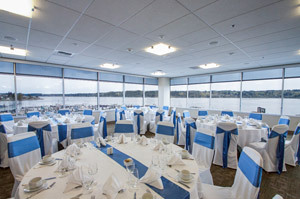 For your reception, the Puget Sound Ballroom opens to the Sinclair Gallery which offers spectacular views of the Sinclair Inlet, Louis Mentor Boardwalk and Bremerton Marina. 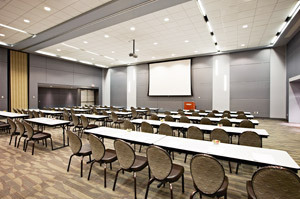 The ballroom can accommodate receptions for up to 450 seated guests. Our Marina Vista room, located on the third floor with 280-degree panoramic views of the water, can accommodate up to 140 for a reception. 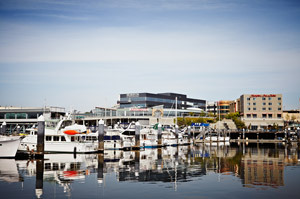 Or, provide a unique experience for your guests in the lovely Fountain Room overlooking Harborside Fountain Park. 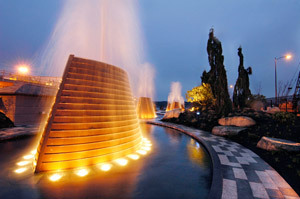 Located on the waterfront, the park features five large copper-ringed fountains that light up in the evening, modern sculptures and lush landscaping. The Fountain Room can accommodate receptions for up to 100 seated guests. We provide both standard and custom menus highlighting seasonal ingredients created by our talented on-site culinary team. Ask about our Traditions to Tie the Knot offering, in which Kitsap Conference Center can replicate a meaningful cultural custom during the ceremony or reception, or re-create a family recipe for your guests. Many brides want mom’s special pie on their big day, but also want mom to be able to relax and take in the full experience. Now they don’t have to choose! Peter and Shannon Johnson were married on a ferry followed by a reception at Kitsap Conference Center. 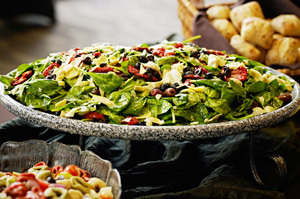 The culinary team at Kitsap Conference Center recreated a chili recipe from the groom’s family and added a custom side kale salad that was modeled after one of the bride’s favorite recipes. Click here to see more from Peter and Shannon's memorable experience. 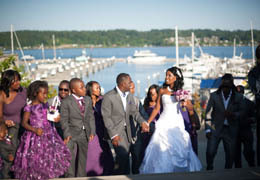 For wedding ceremony and reception package information, click here.